The 3rd SAXONIA Record Festival was held in Linz, Austria. The event was well organised by the City Tourist Board Linz. Christian Fluch (Austria) changed all four wheels of a car without using electric tools within 6:26 minutes. Rainer Wollendorfer (Austria) jumped 132 times on the front wheel of his mountain bike. Richard Vobr cycled 19.3 m (21 yd 4 in) backwards on his tandem's front wheel. Friedrich Konrad (Austria) lifted a 153 kg (337 lb) beer keg, beating the record of George Olesen (Denmark) - established at our 2nd record festival 1996 - by 1 kg. Georges Christen (Luxemburg) blew up a rubber hot-water bottle in 12.6 sec. 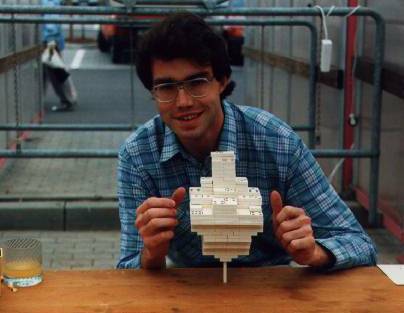 Ralf Laue (Germany) established new world records for domino stacking (529 dominoes on top of a single vertical one) and for pancake tossing (416 tosses in 2 minutes). Open to all comers was a 25 m office chair race (winning time: 6.2 seconds) and the SAXONIA-Pentathlon. The Pentathlon winner was Herbert Krischak. Here are his results: 12.60 m (13 yd 2 1/3 ft) for cherry stone spitting, 1:51 minutes for 5 kg beer stein holding, 8.35 m (9 yd 5 in) for matchstick throwing, a 1.45 m (1 yd 1 ft 9 in) standing backwards jump 51.8 s for the 100 m egg and spoon race. There was also an inline skaters' chain and fireworks lighted by parachutists. A lot of record breaking smallest tools and largest objects from our guests from La Tour Blanche (France) was exhibited. Because of the success, there will be a record festival in Linz in 1999 too. Suggestions for new records are welcome!